Have you come across that article in the magazine with the paint color you just had to put in your living room, only to find it didn’t quite look how you thought it would? Or maybe you purchased a sofa that looked fantastic on the showroom floor, but didn’t hold the same sparkle once it was in your living room. You are not alone. Light can play some dirty tricks, but it can also enhance the beauty in items when used correctly. The list could go on, but you get the idea. Since there is such a vast array of topics to cover in regards to lighting, I will only touch on a few. Here are some tips so unfortunate lighting doesn’t happen to you. You may notice that the natural light shifts in your home throughout the day. Depending on which direction the windows face, you may have a pink and red hue during sunrise and sunsets, then a brighter white when the sun is overhead. If the room has north facing windows it will receive a cool, blue tinted light throughout the day. A room with east facing windows will receive yellowish light in the morning and cooler light later in the day. Learn more in this Sherwin Williams article. Natural light even changes with season. Typically there is a warmer glow in the summer and a cooler tone in the winter. For these reasons, and many more, you should always bring home a sample of the product you intend to use to observe it in the space before committing to a purchase. If it’s paint, buy a sample quart and paint it on a piece of art board and adhere that to the wall to see the effects of the light throughout the day. If it is fabric for a piece of furniture, check out a sample or purchase a small amount, and drape it over a piece of furniture in the space to ensure you still like it from all directions and all light in your home. The type of light bulbs used in your home can have a huge impact. Warmer light is ideal for casual, cozy environments like the living room, while cooler light is more optimal for reading and productivity, like in a home office. Incandescent bulbs tend to have the most friendly and neutral light, but are not as energy efficient as other options and are being phased out and replaced with halogen light bulbs as an incandescent light source. Fluorescent lights give off a cooler blue cast and are more energy efficient. Traditional LED lights also cast a cooler light which is not ideal for warmer colors, especially reds. LEDs do not diffuse light like other options which makes them more ideal for areas that need a focused light, like under cabinets. As an overhead light, LED’s can be too harsh. Other light options include the wide variety of adjustable light bulbs on the market, like the Phillip Hue light bulbs, that allow you to adjust the intensity of the light, color of the lights and create either a warm or cool light. 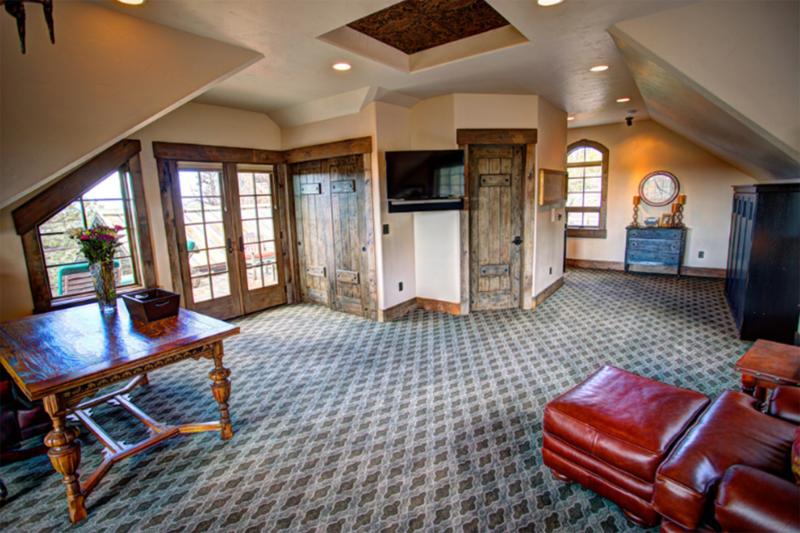 Most rooms will come equipped with some form over overhead lighting like a chandelier or recessed can lights. 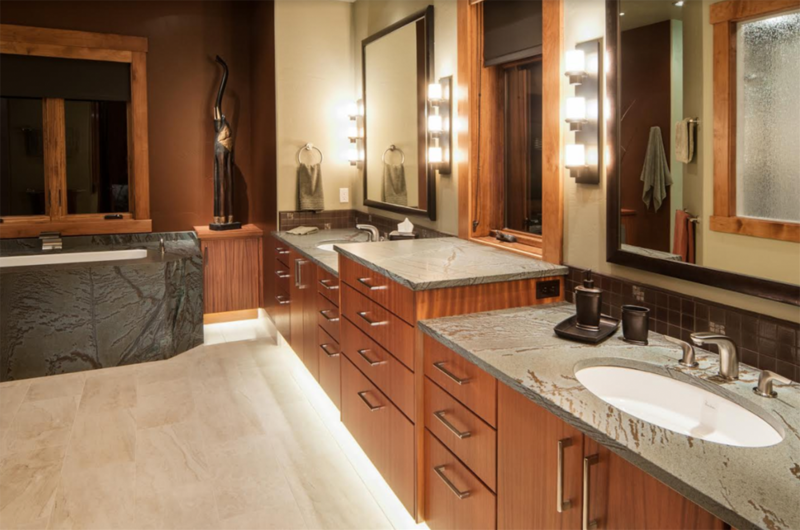 In bathrooms, you might typically have a vanity light over the mirror. 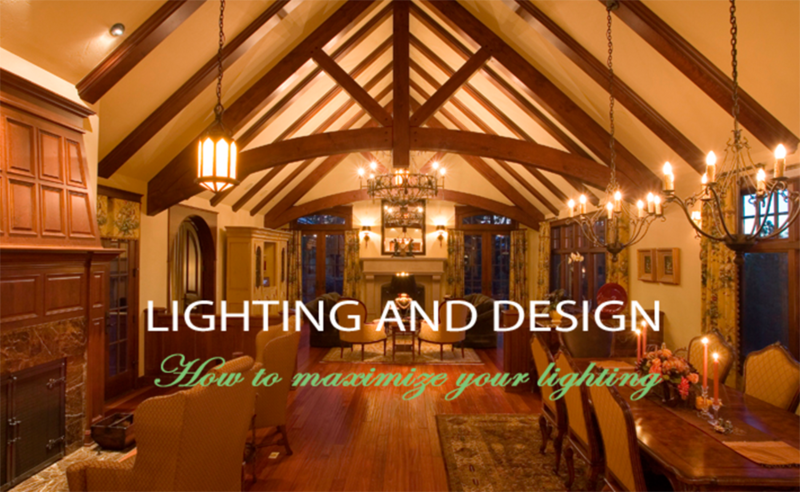 While the overhead lighting is helpful to disperse light throughout the room, it can sometimes create challenges. For example, it is more beneficial to have the sides of the face lit when applying makeup or shaving to reduce shadows which can be accomplished by placing sconces on either side of the mirror as shown in the photo below where I used this practice for one of my clients. See more of this home in my online portfolio. In larger spaces, like great rooms, it is nice to place additional lighting, such as floor and table lamps, that invite people to the space and make it more comfortable for lounging and reading. When you consider how you use a space, think of all the different tasks you will perform there. For example, perhaps your living room doubles as a study space. In this old world home, this room functioned as an intermittent office and guest room. The numerous can lights reduce dark areas in the large space and there is an abundance of natural light from the windows and French doors. A desk or table lamp could be added to the desk to provide focused light for reading and work. Now, how to put this information to use. If you have warm paint colors like oranges and reds that you would like to emphasize, choose lamp shades with a warm tone to help diffuse a warm light, use incandescent light bulbs and add additional lighting like floor lamps or sconces that add soft, indirect light. If you would like to emphasize cooler colors like a blue, than traditional fluorescent lighting will help you to accomplish that. Consider using these colors in a north facing room with natural light that will enhance these colors as well. Keep in mind that fluorescent lighting does not generally complement a person’s appearance, so perhaps again, use floor lighting or lamps in sitting areas where people will gather.